Key West likes to do everything a little differently. One of the weekly events we discovered last year was the Sunday Drag Bingo. Its a rowdy participatory game (as someone there put it: like Rocky Horror Picture Show, but with bingo), and the majority of the crowd is locals. My friend Myron even won one of the rounds this year, and thus had to introduce the next game after recieving his prize bag o crap. 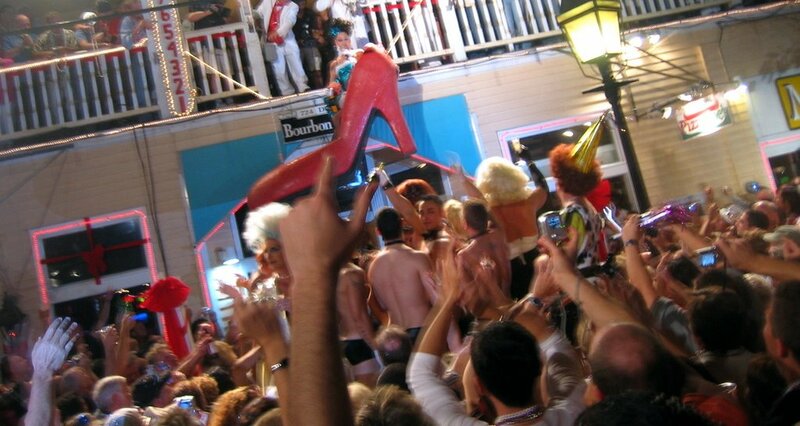 As you may have seen on tv, for the New Years celebration, Key West drops a drag queen (named "Sushi") in a shoe at midnight. The street is packed with people as partygoers on the balcony throw beads to those of us in the crowd below while performers entertain. The crowd is always good natured and the night is always a blast. I even got my own closeup again with Sushi this year.